Danzig [da:ntsiçk / danzik / da:nziç] is a city that is independent territory, but its defense and foreign affairs are managed by the Republic of the Two Crowns. Partially independent since 1807, it has been fully independent since 1948. Danzig is divided into two regions, Danzig-Nord and Danzig-Sud. Before Danzig was established, the vicinity was inhabited by various populations. Referring to the coast, Iordanes mentions "Gothiscandza", and Tacitus referred to the region in his Germania. Both historians believed the area to be populated. The first mention of the city itself dates back to 997 when Adalbert von Prag mentions a Slavic settlement called "Gydannyzc", located in a territory that would later become known as Preimern (Przemarz, Premaria). The Duchy of Preimern was a Venedic fief, which formally became part of the Kingdom of Veneda in 1138. Danzig was its administrative center, and in 1224 it was granted the Lübeck rights. As more and more merchants from the Hansa cities of Lübeck and Bremen settled in Danzig, it rose to become one of the more important trading and fishing ports along the Baltic Sea coast. In 1361, it became a full member of the Hansa. Veneda's hegemony over Danzig ended in 1308, when it was conquered by the Teutonic Order, along with the eastern half of Preimern. This would lead to a temporary reduction of Danzig's significance in the region. In 1454, Danzig joined the neighbouring Hanseatic cities of Elbing (now Elbiądz) and Thorn (now Turoń) in a rebellion against the Teutonic Knights. This resulted in the Thirteen Years War (a.k.a. the War of the Cities), which ended with the Order's defeat and its surrender to the Venedic crown. The territory around Danzig now became part of Veneda, known as "Venedic", or "Royal" Prussia, while Danzig itself became a city republic under the suzerainty of the king of the Republic of the Two Crowns. Once more, Danzig flourished as a trading city, and after the Øresund incident it became one of the founding members of the Baltic League. In the First partition of the RTC, Royal Prussia was annexed by Prussia and became known as West Prussia. Danzig became an enclave separated from the RTC, but remaining under its sovereignty. However, in 1793 the Second partition of the RTC took place: Danzig was forced to give up its autonomy and became annexed by Prussia as well. This situation would not last long, though. With the help of Napoleon, Emperor of France and King of the RTC, Danzig once more became a free city in 1807, and it remained so when the Vienna Congress confirmed the status quo as it had existed before 1793. This would be the beginning of a relatively quiet period, and during the whole 19th century, little would change for Danzig. Initially, neither the Republic of the Two Crowns nor Danzig was affected by the First Great War. This would change in 1915, when the RTC finally declared war on Germany. Within a short time, the RTC was completely overrun by the combined German/Hungarian forces, and when the war was finally concluded in 1918, the RTC ceased to exist. The Kingdom of Veneda became a rump state, only allowed to continue its existence as a German satellite state, while Lithuania became an equally pro-German republic. Danzig remained a Free State, so nominally nothing changed; but in reality, with the RTC's protection gone, it de facto became a German protectorate within the Holy Roman Empire. Shortly after the outbreak of the Second Great War in 1939, it would be fully incorporated into Prussia. After the war, in 1948-1949, both the Republic of the Two Crowns and the Free City of Danzig were restored. Danzig's territory was expanded to its current borders. Since then, the two countries have been closely connected to each other. The RTC is partly responsible for Danzig's defense, and their currencies (the Danziger gulden and the Republic's talar) are linked at a stable 1:1 rate. Danzig is a coastal city with its climate moderated somewhat by the sea. A photo of downtown Danzig. The territory of the Free City of Danzig is entirely enclosed by the Baltic Sea in the north and the Republic of the Two Crowns elsewhere. 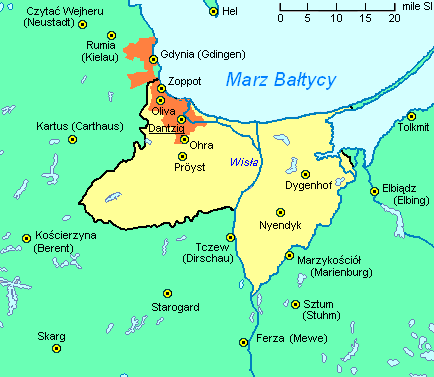 The orange part is the so-called "Trzyczytać", or "Three-city", consisting of Danzig, Zoppot and Gdynia. The population of the free city and its surrounding territories consists roughly of 35% Roman Catholics, 35% Lutherans, 20% Jews, 5% pagans, and 5% adherents of other religions and persons without any religious affiliation. This page was last modified on 26 November 2013, at 21:22.